I'm delighted to share that I've gotten to know super nice and super smart community guy Jonathan Frappier over the past few years, and I even got to hang out with him in a session at last week's Boston VMUG, which included the presenters Emad Younis (who I also know) and Kyle Ruddy. They all had a bit of fun, at Jonathan's expense, go see the pic and links to their sites. We learned, we shared, we had fun. What an awesome community, where we try to help each other, and always enjoy each other's company. Hopefully, next year, TinkerTry will be able to pitch in and provide a give-away to vBrownBag. See also my vBrownBag TechTalk topic here. Nevermind hoping, providing a give-away is now my plan, my promise. So there you go Jonathan, my 2016 New Year's resolution, now in writing! Can you name those guys? Again this year, Jonathan has somehow managed to pull together quite the list of give-away items that any self-respecting virtualization enthusiast would love, it's pretty amazing. Make note of these companies that care, and give back to the community. 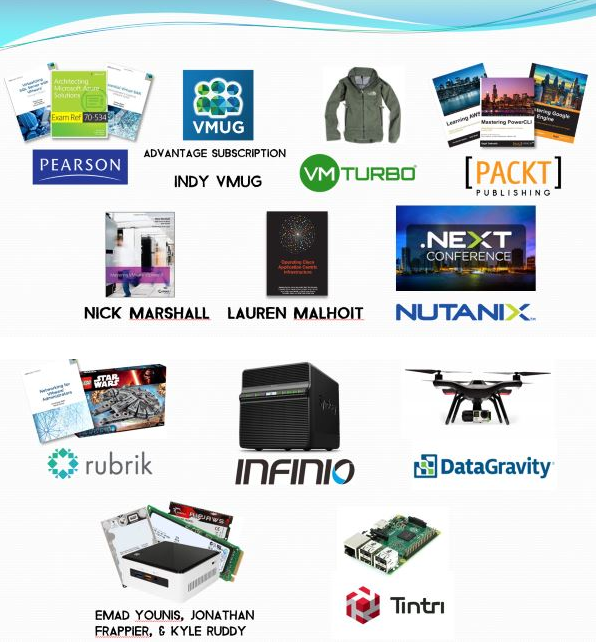 The give-away items even include Mastering VMware vSphere 6, that book I kind of helped with, along with the every home lab's favorite VMUG Advantage that includes EVALExperience. There's even a 4 bay Synology DS414J provided by Infinio, see also my First look at Infinio Accelerator with SuperServer cluster shared Synology iSCSI datastore.